Place this retro-inspired swivel chair in your home for a comfortable and functional place to lounge. The piece is draped in a stylish leather that accentuates the sloping arm and back design extremely well. Furthermore, the swivel base makes interacting with your guests and easier and more enjoyable experience. 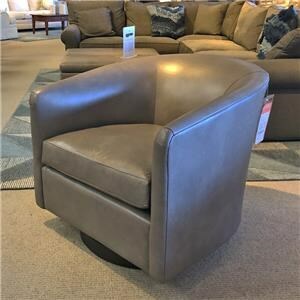 The 1618 Leather Swivel Chair by BeModern at Belfort Furniture in the Washington DC, Northern Virginia, Maryland and Fairfax VA area. Product availability may vary. Contact us for the most current availability on this product. Browse other items in the 1618 collection from Belfort Furniture in the Washington DC, Northern Virginia, Maryland and Fairfax VA area.